A classroom should be an environment that encourages listening, not one with obstacles to understanding. Shuffling feet, HVAC noise, transient external noises, playground banter, talking students, rustling papers, and other ambient sounds all compete with the teacher's voice inside the classroom. Due to this excessive noise and reverberation, students in today's classrooms are unable to hear 25 to 30 percent of what their teacher says. This is the equivalent of missing every fourth word! Removing echos, reverberations, outside noise interruptions and internal vibrations will improve the classroom experience and help create a better learning environment. A good start to reducing classroom noise is by applying noise control treatments to the walls of the room. Acoustic Panels work well in a classroom setting. They require a small amount of wall surface to achieve a positive acoustical effect and can be manufactured in a wide variety of colors, shapes, and sizes. Tackable Acoustic Panels offer a tackable surface and are useful across all types of classroom settings. They can double as bulletin boards and won't take up valuable wall space used to display artwork, maps and other classroom information. Band and choral rooms often have poor acoustics. As a result, students can have difficulties hearing one another and following along with the score. 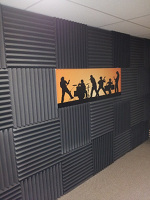 Applying Acoustic Panels, Baffles, or Foam Acoustic Panels to the walls or ceiling of school music rooms will help improve music quality and tone. Acoustic Panels and Baffles also work well in school gymnasiums, auditoriums, swimming pools, and cafeterias. Applications mounted on the ceilings or walls will be secure around flying basketballs and other activities. 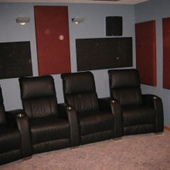 This home theater and listening room has been something I’ve spent years designing. Your panels were the icing on the cake. Thank you so much for providing such an effective and affordable solution.